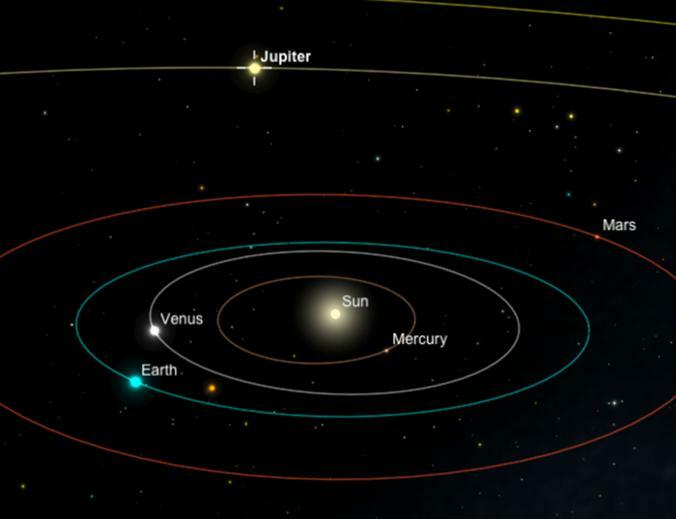 Tomorrow on June 30, 2015 at approximately 2:17 pm Universal Time (7:17 am PT), we will witness a celestial event in which Venus and Jupiter will come closest to one another as the two planets race around the Sun. This can be visible from just about anywhere in the world. Although it is most optimal to view this phenomenon in complete darkness, it isn’t absolutely necessary. Just try to observe it after sunset. According to astronomers, the two planets will come close to less than half a degree. So close that observers can cover both planets with their pinky finger held at arm’s length. 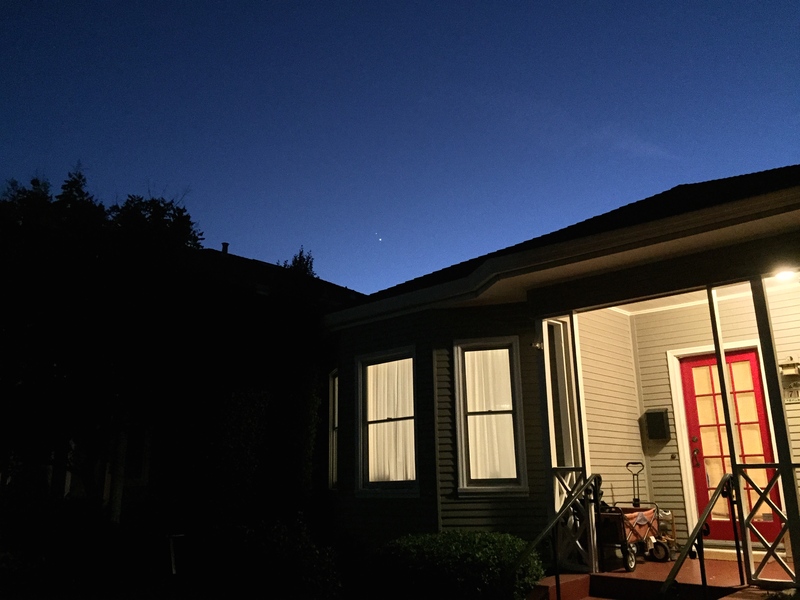 Distant view of Jupiter (left) and Venus (right) on June 29, 2015 from our house. 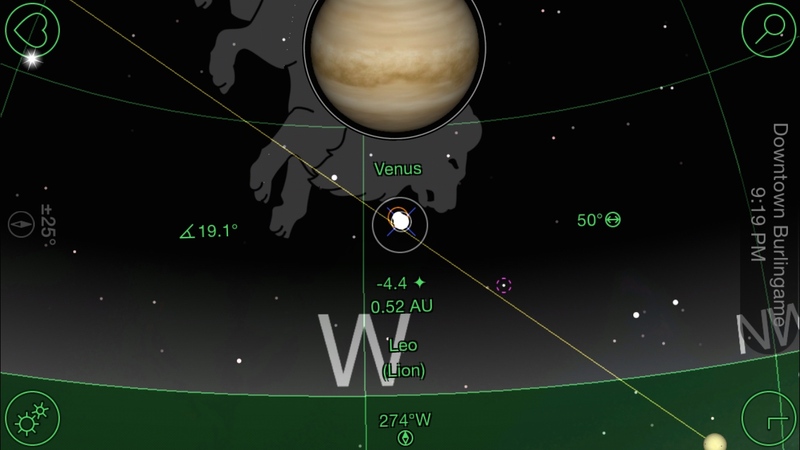 I used the GoSkyWatch app to track the location of both Venus and Jupiter. The yellow diagonal line represents the ecliptic (the plane of the Earth’s revolution about the Sun). Notice that this photo was taken at 9:19 pm. If you look for the two planets an hour or two later, the two planets along with the constellation of Leo (the lion) would have disappeared behind the western horizon. We must keep in mind as we look at the names of the zodiac constellations that at any given time of the year, our Sun is actually in between the Earth and one of these constellations. For example, if you were born in late April to mid May, you wouldn’t be able to see your zodiac constellation of Taurus (the bull) at night, but instead it becomes a daytime constellation, which makes it impossible to see! The reason Venus will appear brighter even though it is 1/10 the size of Jupiter, is because it is covered with reflective white clouds, and it is only 56 million miles (90 million kilometers) from Earth. Jupiter is over 10 times farther at some 550 million miles (890 million kilometers). Just think that there is an empty space of 500 million miles between the two planets but it’s easier to visualize this when we look at a simulated orbital view of our solar system. 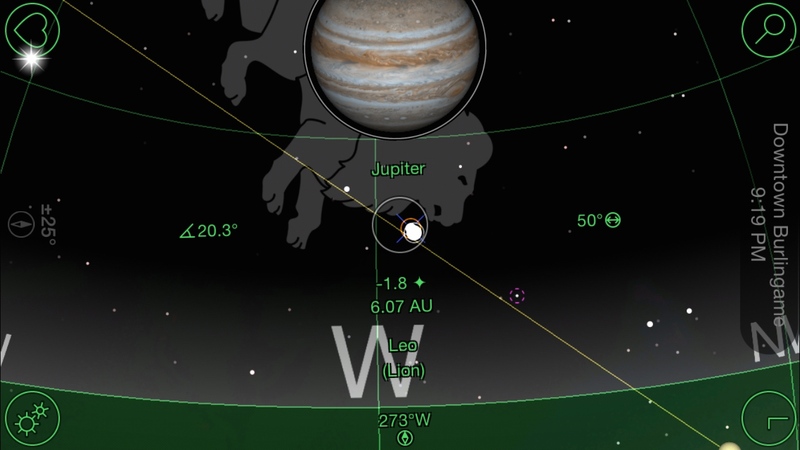 Unlike solar and lunar eclipses, conjunctions are not as rare but they are still spectacular nonetheless. Tomorrow’s conjunction will not be as tight as the one that took place on August 18, 2014, and will be even further apart at their next encounter on October 26th. Jupiter travels around the sun at around 8 miles a second (28,800 mph) while Venus is blazing by at 22 miles a second (79,200 mph) catching up with Jupiter. In other words, it would take Venus only 225 Earth days to make one revolution around the Sun while 11.86 Earth years for Jupiter! In this simulated orbital view, all the planets are orbiting around the Sun in a counter-clockwise direction due to the initial conditions in the cloud of gas and dust when our Solar System was formed. As Venus orbits around the Sun at a velocity of nearly 80,000 mph, it seems to catch up with Jupiter when viewed from our planet.